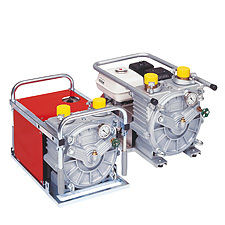 Peristaltic pumps for secure handling of viscous liquids with particles and safety storage. Often used by firefighters around the world and also in Norway. – Outlet pressure 2bar ( max ). – Pumping of media with entrained solids o f 12mm, oil and acids. – Suction lift up to 9m dry running. – Can be supplied with electric, gasoline or diesel engine. – The EL-motor needs 6A ( 1500 W ) as start power.